Remember that time we showed you the lovely “Thieving Bandits” color from the (#BlackOwned) Gold Label lipstick collection? Well, it turns out there was another swatch I forgot I shot, and it looks fabulous on brown and darker skin tones. It’s their “First Class” orange-y, reddish shade. With dollops of blue tints (at least, it seems to look that way), “First Class” is one of those reds that may be a decent find for most brown complexions. I say “may” very carefully, because, in all honesty, there are very few shades of lipsticks that generally look good on everyone. Yet, “First Class” won my heart, while reds have been off the radar for most of the season. 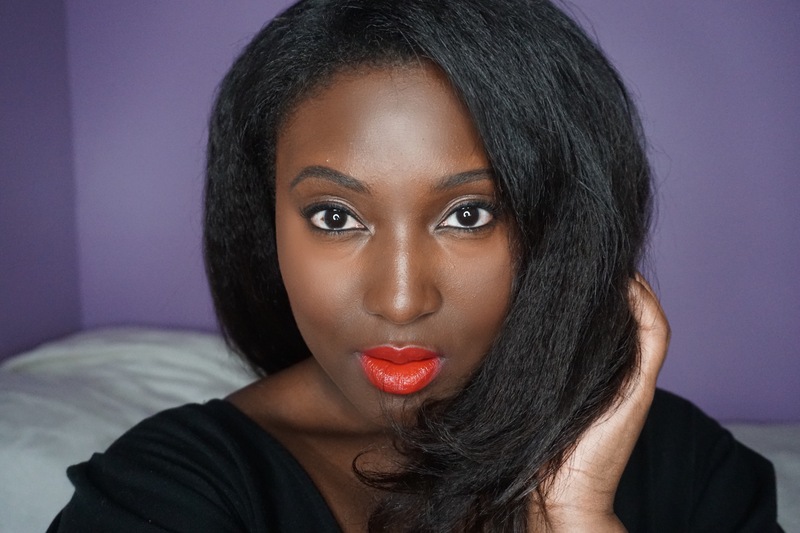 Below, I share some personal “tips” for wearing a red lip the way I did. -With most bright lip colors, I always suggest a smooth layer of foundation, or BB crèmes to help even skin tone. If you’re lucky, you’ll need very little to pull this off. My foundation is the CoverFX Natural Finish Oil Free Foundation in N110. -Highlight those eyes, if you must, to make them bright. Concealers, highlighters or both are fine. I used NARS Cream Concealer. -If you’re a newbie to bright red lips, stay away from color eye shadow. -But, don’t run from a neutral shade, swiped across your lids! -A good eyeliner is fun, but less will always be more. -Give your lashes a pop of volume with your favorite mascara. -Mattify your skin with your best finishing powder. A good go-to: MAC’s Prep + Prime Translucent Finishing Powder. Don’t forget to check out Gold Label Cosmetics (and buy their ish’) + follow me on Instagram for more beauty finds to come.